Content is king – says every advertising agency in Malaysia. Photos, videos, infographics, emotional stories are all designed to go viral and to build relationships. Yet, how exactly do we measure its effectiveness? Most agencies will tell the client they need to make content, but how exactly do you make content? How do you make good content? How do you measure its ROI? How does this translate into actual revenue and profit? Anyone with a phone can make content these days, but with the proliferation of content, we need good ones to stand out. A good advertising agency in Malaysia will help to make sure your content is truly king. No one reads magazines nowadays! That’s partially true. Numbers are declining dramatically for print, yet getting 100% online is not the answer. That’s a hyper-correction, or moving on the other extreme end of the spectrum. There is a role for print; what we need is a smarter strategy. For instance, when a passenger is on a plane with no Wi-Fi or internet connection, your in-flight magazine becomes extremely valuable. You’ve got a captive audience with hours to spare with nothing to read. So, don’t dismiss print entirely. Take a wiser strategy and talk to an agency who has a deeper understanding of things. Miracles don’t happen when you appear in a blog. There are many reasons for this: the blog has a low readership, the blogger doesn’t write well, the subject is not interesting etc. But it’s too late. You blew a ton of money and there’s no second chance. Get an agency with a good network and great contacts; they will ensure your partnerships with 3rd party channels get the best return on investment. As a best online advertising agency in Malaysia, we ensure we communicate openly with our bloggers to ensure they know exactly what to write (why leave it to chance? ), and that the partnership is mutually beneficial. Read about the next awesome advertising strategy Malaysia? Heard about a viral campaign that got your competitor tons of business? If you’re small business owner, you can’t afford to do it all on your own, especially if you have never even done it before. You’ll need a team that consists of a minimum of 3 people: a copywriter, a designer and a technical developer. Do it on your own, and you’re looking at making mistakes, a long and steep learning curve (“What’s an ai file?”), and not to mention, losing focus on what really matters: running your business. You have a great product that millions will buy. You know your product is the best in the world. But the problem is, your customers don't. Every single company needs a megaphone to reach out to potential customers. If they can't find you, they can't buy from you. Everyone needs a little help with creating awareness. Everyone needs sales. This is when Youmo Studio steps in. We're the best advertising agency in Malaysia, and for a good reason: local knowledge. Our consumers have a unique purchasing behaviour, and unique knowledge is needed to understand them. Which is why amongst advertising companies in Malaysia, Youmo Studio stands out. We're a home-grown online advertising company. As a great advertising agency who is an early innovator, we bring in the newest ideas and implement them locally. We create crystal-clear, uncomplicated, client-friendly, customer-centric, inspiring campaigns. All with one goal in mind: sell your products. We do this by chasing leads, taking customers and putting them into segments according to how receptive there are to your products, and then launch into a sales process they cannot resist. By consistently educating potential customers on why they need to buy your product, we are creating a huge pool fan that is receptive to your key messages. That is why most of our Clients will tell you that while they have tried many advertising companies in Malaysia, ours is the one they stick with. Working with Youmo Studio is pretty straightforward.Tell us what you need, and we will convince everyone how they cannot live without your product. Tap into the world's biggest distribution channel: the internet. Talk to a hungry audience, build huge pools of fans and engage customers. Who says print is dead? Get your brand on billboards, magazines, newspaper, newsletters and niche publications that target specific customers. Use unconventional methods of reaching potential audiences. Crazy ideas are bound to capture lots of attention. Great for those with limited budget but want big impact. Want to scream into your customers' ears when there is no escaping? Use radio! What better way to advertise when they have to listen to you? Drove along a highway and seen a great ad? Remember that feeling? Get your brand onto billboards, lamp pole buntings and shopping malls. The best advertisers find creative ways to slip in an ad when the customer least expects it. Product placement put your brand in everyday things or spaces. Did you know there are more mobile phones than people? Mobile phone is the number 1 place that captures and keeps the most attention. When it comes to advertising and marketing, we're really traditional. Why reinvent the wheels when it works? 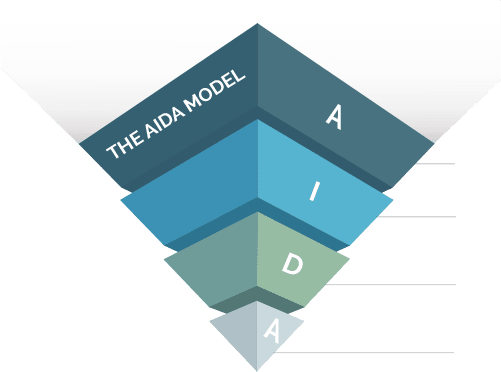 The AIDA model is a world-famous model that a potential customer goes through psychologically. It is a funnel that all of us go through when we buy something. The AIDA model can be used everywhere – in an advertisement, on radio or online. Youmo Studio uses the AIDA model to communicate to your customers. We ask ourselves how we can speak to them more effectively and tailor-make our messages to fit what customers need. So in our first meeting with you, we will be asking you a lot of questions using this model! This is the part where we create awareness about your brand or product. Here, we get them really interested by using provocative questions to get them thinking. This is where emotions come in. From a product they merely 'want', we make it a product they 'must have'. This is where the real test is: do people actually take action? Do they do it now?